In olden days, humans designed and produced tools on their own to suit their individual needs. Today, products and equipments used at workplaces are designed at one location, manufactured in the second, purchased by a wholesaler (buyer) in the third location and finally used by the customer elsewhere. In short, the designer might not even be aware of the end users and the buyer or customer cannot influence the design of the available equipments. 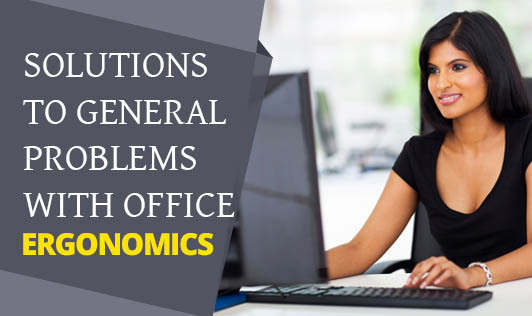 This is the main reason why general problems related to ergonomics are triggered. However, there are a few ways in which you can modify your working environment and practice good ergonomics at your workplace. Equipment Positioning: Ideally the computer monitor, keyboard and chair should be placed in a straight line. Placing the monitor at one end due to space limitation can cause neck sprain as a result of twisting. Adjusting the keyboard at an angle to the chair to clear space in the centre for other work causes strain in the wrists, shoulders, and arms. The best option would be using a retractable work platform and keyboard tray. An L-shaped desk or a rolling computer platform can also help. Height of Table and Chair: The height of the working desk and chair should be adjusted such that it enables the user to maintain straight wrists, place his/her feet evenly on the ground and keep the elbow at an angle greater than 90 degrees. The chair should be adjusted such that the top of the monitor is at about eyebrow height. Glare: Often users struggle to see through the image of a window or light on the monitor. Glare makes it harder to look at the screen and causes eye strain. You can either tilt the monitor screen vertically or reduce glare on the monitor. Ergonomical Chair: A chair should provide enough back support. If not, use a pillow to provide temporary back support and relax the spine. Cramming the Phone: Forcing the phone receiver between the ear and shoulder to free up your hands for performing other activities will likely lead you to developing neck and shoulder pain. The best solution is using a speaker phone or a headset. This increases productivity and eliminates the possibility of neck or shoulder pain. Typing Technique: Raising the thumb, hitting the keys too hard, and resting or pressing the wrists on the desk platform are a few examples of poor typing techniques. Typing should always be done with relaxed fingers and wrists. The wrists should always be free over the keyboard while typing.